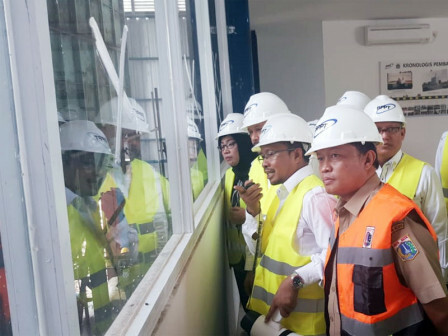 Jakarta Environment Agency Head, Isnawa Adji along with the Application and Assessment of Technology Agency’s (BPPT) IT Sector Chairman are reviewing the solar power plant (PLTSa) construction in Bantargebang Landfill, Bekasi, West Java.
" Thus far its construction has touched 90 percent"
Their arrival aims to see directly incinerators, workspaces, steam boiler machines, turbines, and garbage shelter. "Thus far its construction has touched 90 percent," he expressed, Tuesday (2/12). Adji explained that PLTSa would be able to manage garbage up to 100 tons per day to be converted into 500 kWh of electricity. PLTSa itself is a pilot project for the use of garbage as a source of electricity and becomes the Environment Agency Strategic Area activity through the optimization of Bantar Gebang landfill. "It becomes a part of Waste to Energy program," he said.